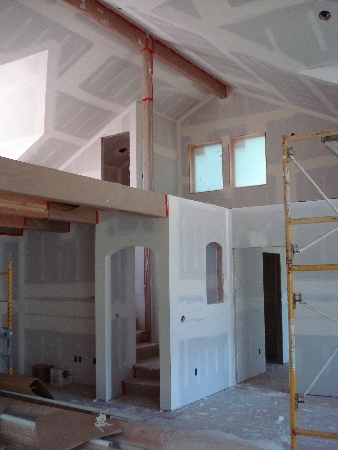 I had some trepidation when we embarked on our homebuilding project. My wife, Patti, was raised in the heart of New York City and loves Victorian style. I had lugged home from overseas a large collection of marine antiques and had evolved through numerous architectural desires, including rustic log cabin and prowfront Lindal-style cedar. 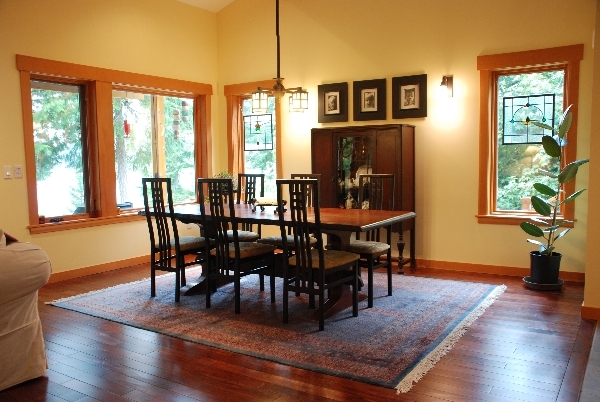 We were elated to find that we both loved the Craftsman bungalow style. The specific springboard for our custom design came from a photo of a California home. This spawned a long campaign of idea collection in the form of photos, brochures and sketches. Our design ended up three-quarters “design by imitation” and one-quarter fine-tuning specific dimensions and added elements. 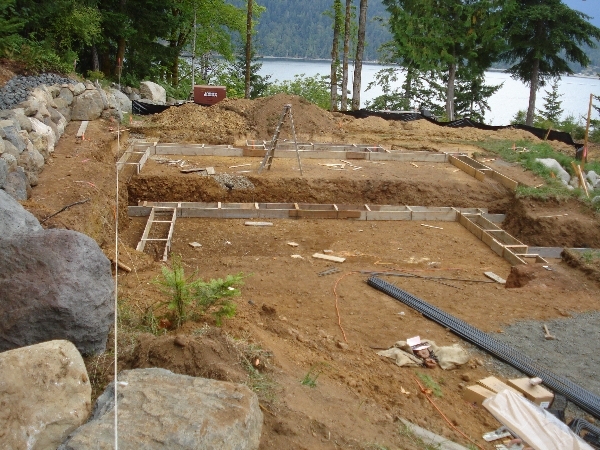 Our building site overlooking Washington’s Hood Canal affords views of the bay and the surrounding mountains. We both envisioned a home with a largely open floor plan and views from as many rooms as possible. Patti wanted her own spaces for reading and craftwork. I wanted a project area to support woodworking, gardening and other avocations. Our designer, Jim Merrill, commuted to the site and eventually asked a pivotal question: “what do you want to be perfectly satisfied with this home?” After numerous sit-down sessions during the design process, with real-time additions and subtractions, we had our answer: a footprint of 1,400 square feet, with partial loft and full basement. The living, dining, kitchen and master bedroom would have magnificent views, and the loft would be open to the living spaces below. The construction bid we settled on was appealing not only by virtue of its bottom line but because it took the form of a detailed spreadsheet complete with material specifics, amount of contractor markup, options and alternate choices. Dan Nieman, the contractor, also came highly recommended by neighbors and lives near the building site. Furthermore, he accommodated several re-bids as we vacillated about the amount of owner-furnished material and labor. Once our home’s footprint was located on the property, we struggled more than we had expected with its height. Our basement allowed for adjustment of its wall height and the thickness of the first floor, and Dan cleverly built a temporary vertical “storyboard” with the basement and first floor heights clearly identified on a 2 x 6. To clarify our final decision, we stood on the tailgate of his pickup and ogled our future livingroom view of the bay and mountains. 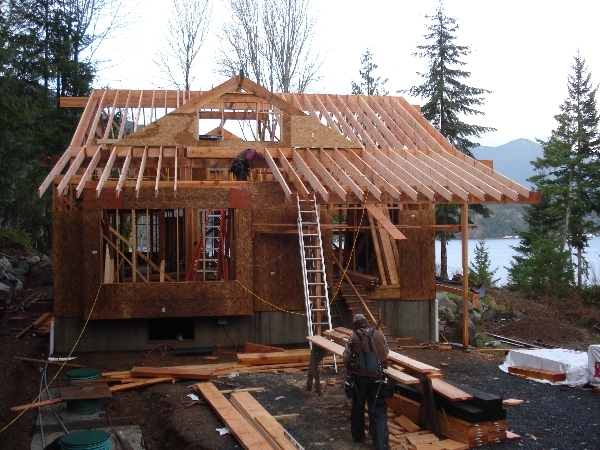 Framing and exterior finishing were exhilarating to watch, especially because they were carried out by a real family operation. Dan’s son provided valuable labor services, and a daughter hand-dipped, brushed and stacked the entire shingle inventory herself. His wife kept the books, and his father-in-law fashioned some of the custom wood trim. The two very talented primary carpenters were young men local to the area. We spent a lot of time on the pros and cons of various heating approaches. 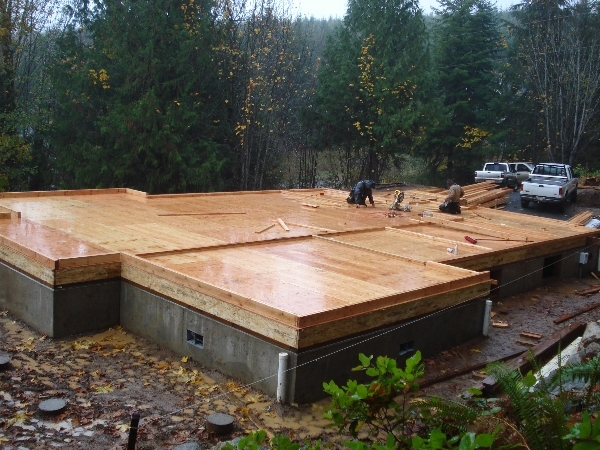 We settled on radiant floor technology, even with its greater installed cost, because of its more comfortable heat. 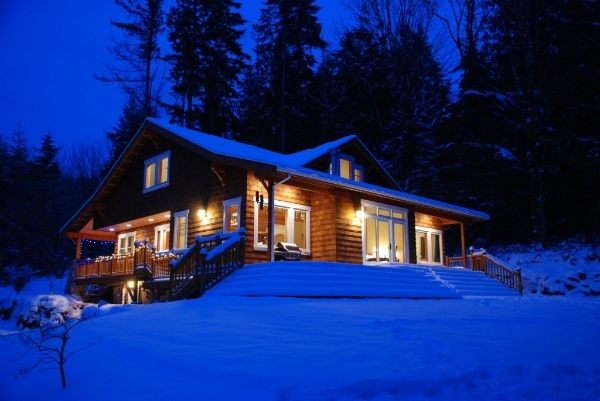 The basement and first floors are heated actively, and the loft is warmed passively from below. A ceiling fan drives heat downward from the vaulted ceiling. I am a thoroughly visual person with a keen interest in balance and proportion, and Dan and I conferred constantly during the construction. I would furiously work out a scaled drawing in the evening and show it to him the next morning. I got totally involved in the dimensions of the window trim, the rafter tails, the exact locations of lights, the radius of the arches over interior passages, the pattern of the railing, the deck layout and finishing, the dimensions of the porch columns and the patterns of cultured stones on the chimney. I mocked up the shingle-reveal pattern and experimented with all the preservatives that we considered. I even sent Dan up a very high ladder and asked him to hold in place an assortment of cardboard cutouts of my various brace designs. In the end, we are extremely pleased with the results and deeply thankful to Dan for his unwavering patience. Move-in day was most exciting. 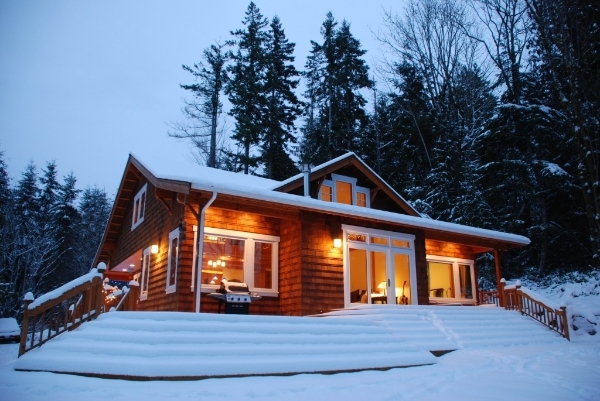 We commuted across town for the last time, taking possession of our new home blanketed in a fresh coat of snow. We were immediately enthralled with the floor plan, component choices and details that we had invested in so heavily. 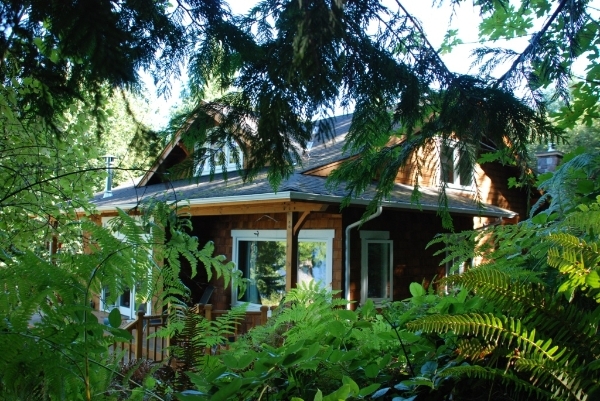 We have lived in our bungalow creation for almost two years and continually marvel at many aspects of our new home. All the rooms worked out exactly as planned. In the master bedroom, the most isolated, we awake to views of the bay and the snowcapped Olympic Mountains. Occasionally, the moon is reflected on the surface of the pond outside our window. The kitchen is centralized and provides excellent eagle-watching from the cook-top. The loft is directly linked with kitchen, dining and living spaces, providing a sort of spatial intimacy. The basement doubles as a shop and craft area and supports woodworking, stained glass and other diversions. Style differences? In the end, Patti and I assigned nominal ownership by floor. She officially rules the loft, I have the basement, and the main floor is a blend that seems to work. We have several examples of ad-hoc style fusion: marine antiques get comfortable next to collector plates and lace. All of our deep immersion in the design and building process proved to be exceedingly worthwhile. Patti had distanced herself more than once in the early stages when I had pulled off the road and was measuring shingles on a tavern, lighthouse or restored landmark, but we believe that these steps made for a tremendous product. Some suggest that you will have considered strangling your spouse or your contractor by the end of a homebuilding project and will never consider doing it again. We had the opposite experience: combine an engaging site, a design that works, and a skillful contractor who’s easy to work with, and the journey and end result can be terrific. Alan Herold works in Poulsbo, Wash., developing underwater equipment for ocean projects. Patti gardens and volunteers in the community. Both hike the mountains, enjoy the view, indulge their grandchildren, and harvest crab, shrimp, mussels and oysters from the beach.